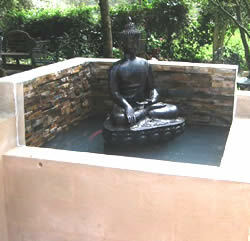 Incorporating a garden water feature or pond into your landscaped garden rockery will create a calm and serene feeling of tranquillity. We supply and install all equipment needed for your selected water feature and will create individual design to best suit your garden space and budget. Our landscaping team will help to create environmentally friendly solutions by advising you on rainwater harvesting solutions (rainwater tanks) and grey water processing. 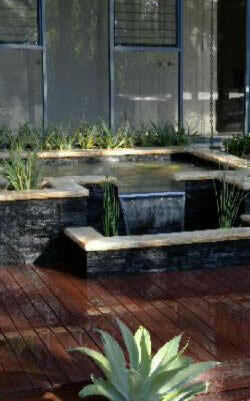 We supply and install all landscape irrigation systems needed for your landscaping project. All equipment installed is of high quality and all watering systems provide the best possible coverage for your style of lawns and gardens. Drip irrigation applies moisture directly to the soil and is a used more so on garden beds than turfed areas. This type of system can save time, money and conserve water if correctly installed. It can can be set up to only feed certain plants and there is no wastage spilling over garden paths and roads. Sprinkler systems are used for watering large flat, absorbent areas of turf or garden beds. Spray heads or rotor heads can be chosen for different levels of moisture distribution needed in your garden area. Automated sprinkler systems are operated by automatic timing devices. If used wisely these can save a lot of time and ensure your garden is getting the right amount of watering it needs to grow healthy and strong. Landscape drainage is a main foundation for your landscaping project. Without proper drainage your new landscaped garden could turn into a muddy disaster, our team of landscapers take the time to build a strong and adequate drainage foundation to suit your projects specific needs. Types of drains available for drainage solutions are underground pipes that empty water onto the stormwater or channel drainage that leads runoff rainwater water away from the building and prevents the flooding of your landscaped garden.